Are you looking for THE BEST BBQ? Well, look no further than Saw's BBQ in Homewood, AL. I ordered the pulled pork sandwich and Tadd got the pulled chicken sandwich. 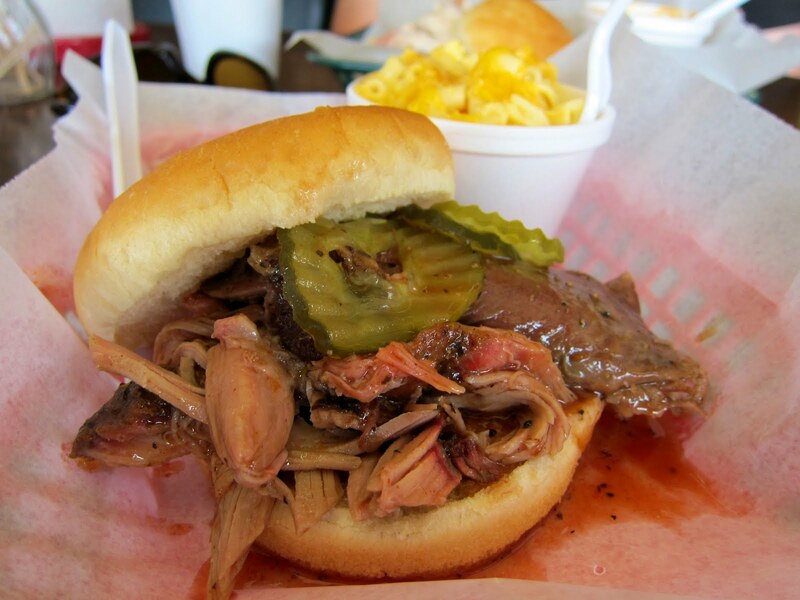 I've never had a pulled pork sandwich quite like this one. You can tell the meat was fresh and they pulled it when you ordered the sandwich. It was so juicy and flavorful. 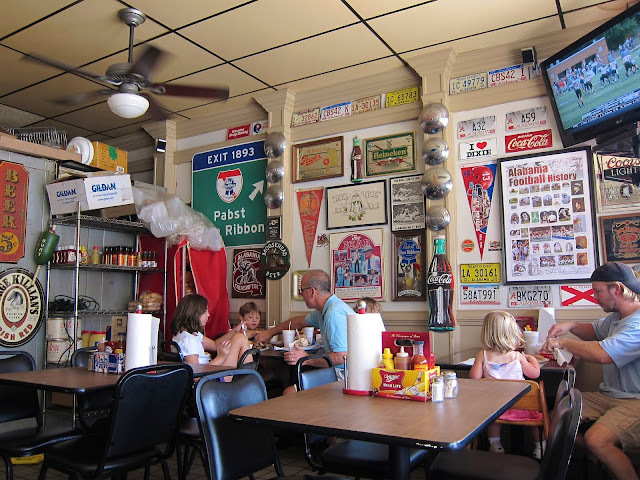 The chicken sandwich was also the best we have ever had at a BBQ joint. It was extremely tender and juicy; not dry like some chicken at other BBQ joints. The white sauce was ridiculous. 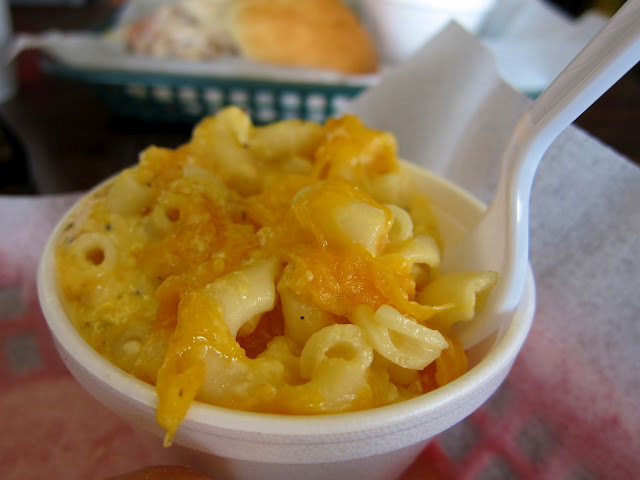 The mac & cheese had SO much cheese; you couldn't take a bite with getting a ton of good stringy cheddar cheese. 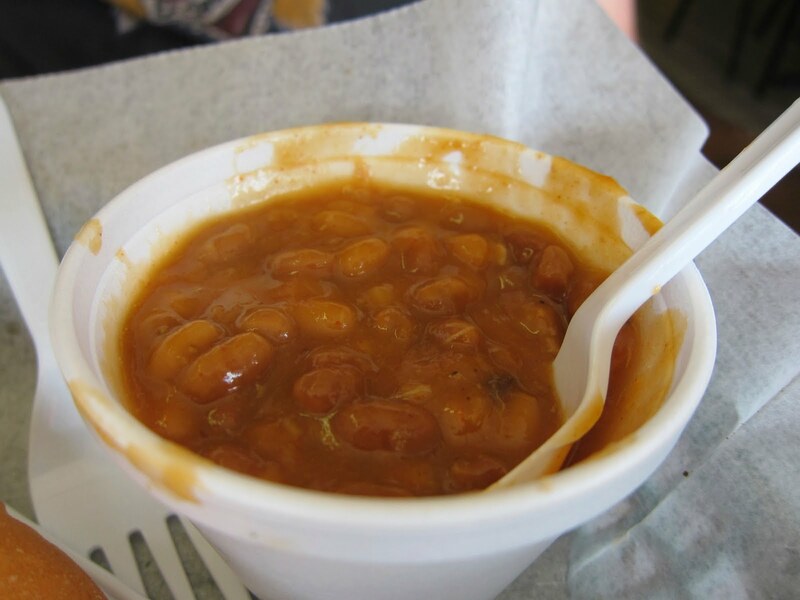 The baked beans were tasty as well. They were very mild and good bbq flavor to them. I could have eaten a ton of them. 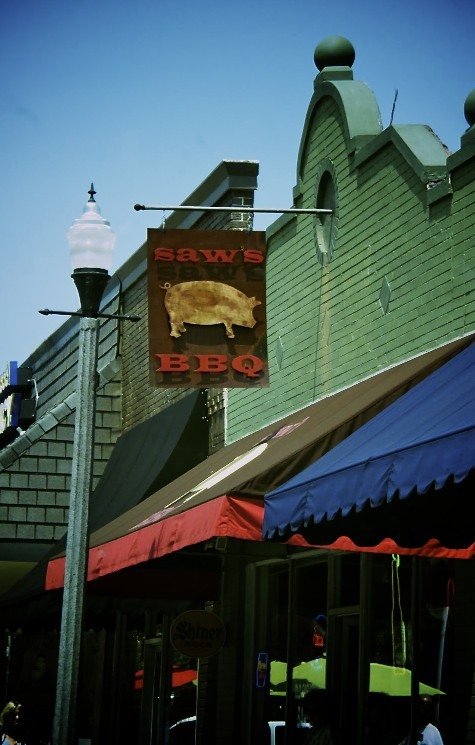 The key is to eating at Saw's is to get there early. There aren't a lot of seats and this place gets busy. We arrived at 11:30 for lunch and we were one of the first people there. By the time we left the line was out the door. The decor is very Southern BBQ joint. 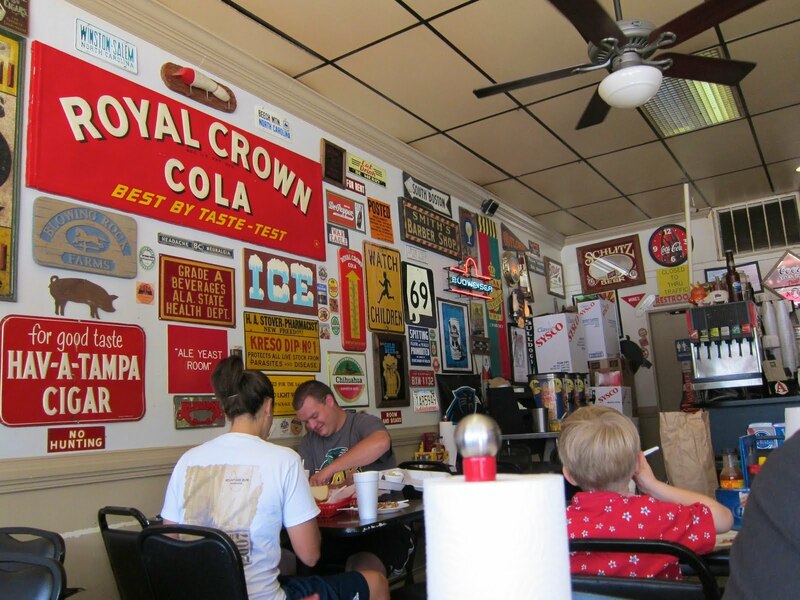 It has license plates, street signs, old cola/food signs and lots of football stuff on the walls. I loved that the sauces and salt & pepper were in old 6-pack containers. Saw's BBQ isn't fancy, but it sure is something special. It is a MUST if you are in the Birmingham area. ohmygosh, it really looks good Stephanie. Wish I lived close enough to go. There's so much mediocre to poor restaurant BBQ out there, it's always great to find some you really like. I don't know if you read "Eat, Love, Pray" but I feel like you just handed me one of the insider's sacred scraps of paper with the name of the best local restaraunt scribbled on it. Both sandwiches looks amazing and the side look delicious. 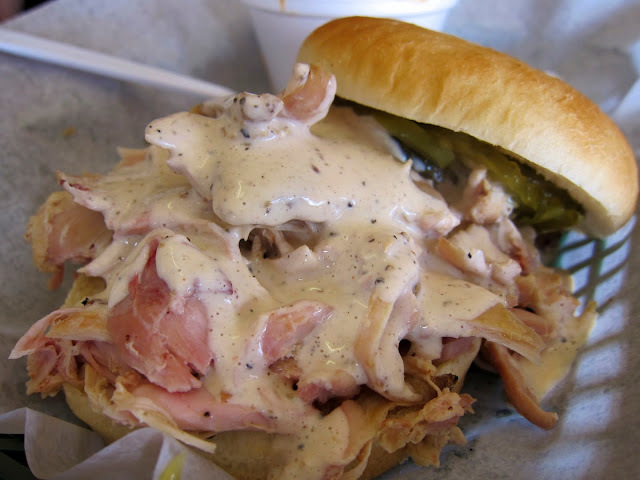 OK, I have used white sauce for two years but never thought once to use it as a condiment on a chicken sandwich! DUH! I put it on the chicken but didn't follow up on the sammie. Sounds like a cute place and from the looks of the pulled pork, good que! Oh my, it all looks good!